A young caver's body has been retrieved from deep underground — almost 40 years after he was killed. Paul Esser, 21, died in 1971 on an expedition into one of Britain's most dangerous caving systems with pals. The remains of the medical student from Surrey were found at the time. But after several failed attempts it was deemed too risky to bring them back up. When two rescuers recovered the body last week, members of Paul's family travelled to the Porth yr Ogof caves in Ystradfellte, Powys, from their home in Germany. A police spokeswoman said: "It is a tragic story. But his remains have now been brought out and released to his family so they can have a proper funeral." The Powys coroner yesterday recorded a verdict of accidental death. An enormous subterranean cave in Antalya is being properly explored for the first time. A team from Antalya Akedeniz University is surveying Suluin cave, located in the southern Taurus Mountains. They’re measuring its depth and taking pictures in order to further study the area. As yet, it’s unknown just how deep the cave goes. Diving in the cave has been forbidden since 1955, when two American divers died while exploring the mysterious cave, thought to be the largest on the Asian continent. Suluin cave is part of an enormous underground cave system, and very little of the system has been properly explored. It’s thought that thorough examination of the cave may yield some important information – and some hopefuls are even anticipating that the network’s underground reservoirs may be a solution to Antalya’s water shortages. 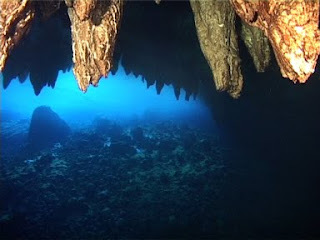 Underwater cave diving is very difficult from diving in the sea, and the slightest mistake can result in death. It’s an activity that’s not for the faint-hearted, but explorers consider the incredible underground landscape to be worth the risk. See the BBC video here. A team of explorers managed to connect two large cave systems in New Zealand. Kieren McKay, Aaron Gillespie, Troy Watson and seven other cavers went into the Ellis Basin cave system in New Zealand’s Kahurangi National Park. All three are members of the New Zealand Extreme Caving Team in search "… for a cave that passes an international milestone, [3,937 feet] 1,200 meters deep and up to [62 miles] 100 kilometers long," according to their website. The goal of the "2010 Expedition to the Ellis Basin" was to survey the cave system beneath the top entrance, called Tomo Thyme. Water from the cave system emerges in a huge spring at the head of the Pearse River, over 5 miles (8 kilometers) away. The team says that the Pearse Resurgence must be replenished from unknown caves that drain thousands of acres of terrain, full of deep shafts and disappearing streams. During the three week expedition, the team managed to survey a total of 1.6 miles (2.5 kilometers) and discovered and documented blue stalactites in the Tomo Thyme area of the cave system. The Ellis Basin is currently in the top 80 of the world’s deepest cave systems. 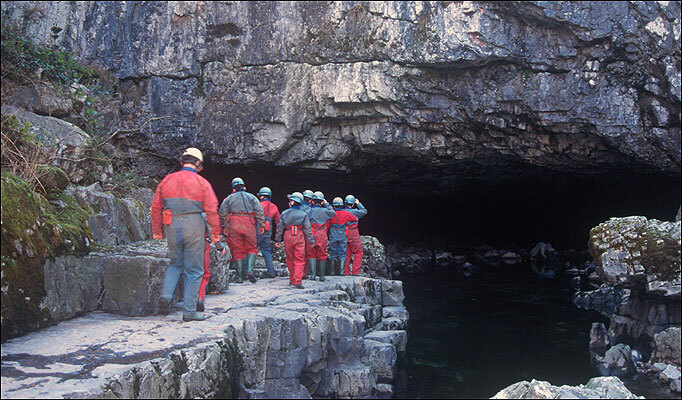 Kieran hopes that future connections will eventually bring the system into the top-10 of the world’s deepest caves. A new study led by Ohio University scientists suggests that early Native Americans left a bigger carbon footprint than previously thought, providing more evidence that humans impacted global climate long before the modern industrial era. Chemical analysis of a stalagmite found in the mountainous Buckeye Creek basin of West Virginia suggests that native people contributed a significant level of greenhouse gases to the atmosphere through land use practices. The early Native Americans burned trees to actively manage the forests to yield the nuts and fruit that were a large part of their diets. "They had achieved a pretty sophisticated level of living that I don't think people have fully appreciated," said Gregory Springer, an associate professor of geological sciences at Ohio University and lead author of the study, which was published a recent issue of the journal The Holocene. "They were very advanced, and they knew how to get the most out of the forests and landscapes they lived in. This was all across North America, not just a few locations." Initially, Springer and research collaborators from University of Texas at Arlington and University of Minnesota were studying historic drought cycles in North America using carbon isotopes in stalagmites. To their surprise, the carbon record contained evidence of a major change in the local ecosystem beginning at 100 B.C. This intrigued the team because an archeological excavation in a nearby cave had yielded evidence of a Native American community there 2,000 years ago. fungal growth on its muzzle, ears and wings. A leading bat expert with the USDA Forest Service's Southern Research Station has identified nine bat species in Georgia, Kentucky, North Carolina, South Carolina and Tennessee that she believes are most threatened by white-nose syndrome (WNS), a fungus that kills bats and appears to be rapidly spreading south from the northeastern United States. Station Research Ecologist Susan Loeb, Ph.D. says WNS has been confirmed in Tennessee, and she says it is just a matter of time before the fungus is detected in Georgia, Kentucky, North Carolina and South Carolina. "In the five states where most of my research has centered, little-brown bats and Indiana bats are among the most threatened by WNS -- meaning their populations could either be seriously decimated or become extinct," said Loeb, a veteran wildlife researcher based in Clemson, S.C. "Historically, little-brown bats were quite common, but the species appears to be especially susceptible to the fungus and is being hit hard in the states where WNS has taken hold. While populations of the federally endangered Indiana bat showed signs of rebounding in recent years, those gains may soon be negated by white-nose syndrome." A fossil skeleton of a child discovered in a cave system known as the Cradle of Humankind may represent a previously unknown stage in the evolution of man, The (London) Sunday Times reported. The skeleton, which is almost complete despite being two million years old, is believed to belong to one of the hominid groups that includes humans. Hominid fossil finds are usually little more than small bone fragments. Scientists hope such a complete find will help them to work out what our ancestors looked like and to determine key dates in their evolution from ape-man to man-ape. Experts who have seen the skeleton says it resembles Homo habilis, the first species of advanced human. 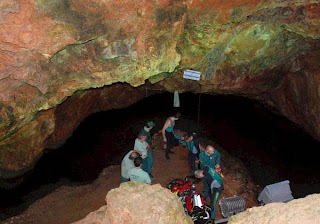 The skeleton was found by Professor Lee Berger, reader in human evolution and the public understanding of science at the University of the Witwatersrand, South Africa, as he explored cave systems in Sterkfontein, a Unesco world heritage site. The caves are the site of one of the world’s longest-running archeological excavations and are regarded as paleontological treasure troves. Jacob Zuma, the South African president, visited the university to view the find, which is to be announced this week. The new fossil skeleton was found with a number of other partially complete fossils, encased within breccia sedimentary rock inside a limestone cave known as Malapa cave. The body of a diver who has been missing since Thursday has been found in the Cueva de Agua in Cartagena, Murcia. 41 year old Antonio Pedro Martínez Abril was from Zeneta, Murcia, and had made the dive with two friends on Thursday. The search started on Friday but had to be delayed for several hours because of the rough conditions of the water underground. Finally the body was found in the first dive carried out on Saturday in an area which had not been previously searched. Two expert divers from the Guardia Civil died in the same cave 14 years ago.